"Never send a hero to do a villain's job." That's the motto that Disney villainesses would live by if they decided to form an elite alliance, like the characters in The Expendables! Of course in this instance there would be crimes committed rather than solved, but isn't it more fun to be bad every so often? 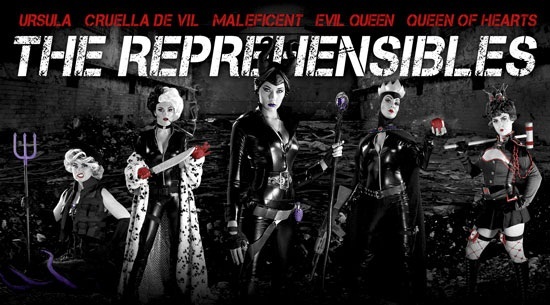 In a mash-up we have dubbed "The Reprehensibles," 5 of the most notorious Disney baddies have been given their own Expendables style movie poster! Maleficent has her own movie premiering this Friday, so she insisted on being in the middle. We thought it wise not to argue with Maleficent. Maleficent is the self-proclaimed mistress of all evil. With that attitude and those horns, that sounds about right. Few could stand a chance against a woman that delights in causing the untimely demise of puppies. Mirror, mirror on the wall. Who is the baddest of them all? She that liveth by the creed, "off with their heads," pulleth no punches. We pity any poor, unfortunate soul that tangles with this famous sea witch. This article was reposted by permission from HalloweenCostumes.com where you can find all the gear to make your own villain costume!